What makes Hong Kong so important as a financial capital? For more than 150 years, business people have turned to Hong Kong as the gateway into the exotic marketplaces of Asia. For historical reasons, Hong Kong has long served as a middle ground between the western world and the middle kingdom in particular, a buffer where two unique, vibrant, but quite different cultures could mix and come to terms with each other. Today, it is in an ideal location to help foreign investors serve and expand the Chinese economy, which shows promise of becoming one of the world’s most dynamic as we move deeper into the 21st century. What kind of business infrastructure does Hong Kong offer? Hong Kong’s infrastructure is advanced and completely modern. This, coupled with its unique geographical location and industrial spirit, has firmly established its reputation as Asia’s leading commercial, financial, legal, and logistics centre. There is no better place to be as China continues to expand trade with the west, providing lucrative opportunities for both sides of the equation. Hong Kong company formation makes sense for those seeking to reach this market of more than one billion souls. What does setting up a business in Hong Kong through you involve? When we set up a company in Hong Kong for you, we handle almost the entire process and ease your settling-in period before you begin operations. We apply our unique experience and position as a respected Hong Kong company registration service to help you accomplish all your business and financial intentions in China. We firmly believe that there is no better place in the world to invest at this time, and no better advisor than Fung, Yu & Co. to guide you through the intricacies you may face as you open a company in Hong Kong. Why is Hong Kong incorporation so important? We operate in the ideal gateway to China’s thriving market; for company formation, Hong Kong simply has no peers. Our city could not have been better situated if its location had been planned in advance, rather than the result of the fusion of natural and historical forces. Not only does the Hong Kong Special Administrative Region (HKSAR) have the advantage of long-term experience in trading with China, it is also culturally and linguistically compatible in a way that no other trading hubs anywhere in the world can boast. How else does Hong Kong’s financial environment contribute to WFOE set-up? Hong Kong has a long history as one of the world’s most important trading centres. As a Special Administrative Region of China, it continues to offer plentiful opportunities for foreign investment and room for sustained growth. The established legal and administrative bodies and simple tax regime are coupled with a world-class banking system. These factors make it an ideal location for your company’s headquarters in Asia, as well as offering a strategic springboard into the Chinese market. Our Hong Kong company setup service makes it even easier to get started. Does Hong Kong have the strategic positioning to help us succeed? Nestled in the heart of Asia, Hong Kong is a brief flight from most major cities in Mainland China; one-quarter of the world’s population (not counting other cities in Asia), and one of the world’s fastest-growing markets, is no more than a five-hour flight away. Our international airport is among the busiest in the world, with direct flights to over 180 international destinations worldwide, including 44 major cities in China alone. How difficult is it to set up a company in Hong Kong? 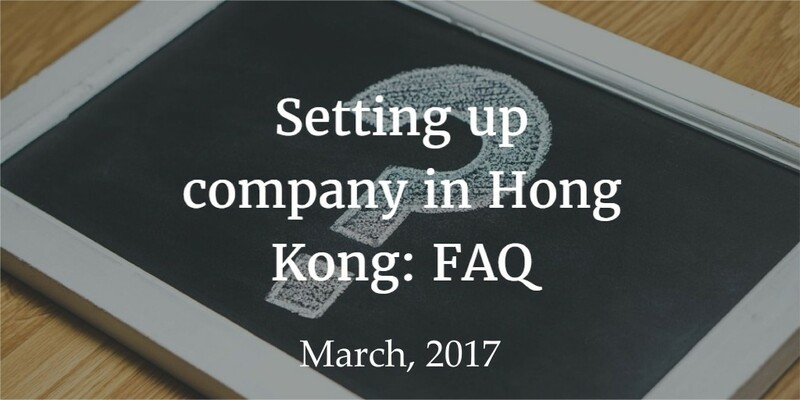 Hong Kong company setup is fast and easy, providing an ideal vehicle for further expansion in the region. Among the many benefits of setting up here and maintaining a company secretary in Hong Kong is that companies in the region receive preferential tax treatment under the current CEPA (Closer Economic Partnership Arrangement) between China and Hong Kong. In addition, Chinese is the official language of law in both Hong Kong and Mainland China, offering a practical advantage for foreign investors negotiating this dynamic new market. Will my company be doubled-taxed if we set up in Hong Kong? Apart from its strategic relationship with China, Hong Kong has also entered into various Double Tax Treaties with over 53 countries worldwide that avoid duplicate taxation, providing excellent tax incentives as a hub for any offshore company in Hong Kong wanting to conduct international trade in Asia. What is the hardest part of setting up in Hong Kong? To the surprise of many foreign investors who set up their company in Hong Kong, getting a Hong Kong Corporate Bank Account is often the most difficult part of the process. Hong Kong banks are very cautious, often requiring a great deal of paperwork before they allow a foreign business to open a corporate bank account—if they are willing to do so. (Other types of bank accounts are easier to establish). However, Fung, Yu & Co. maintains close relationships with several influential local banks, so we can work with you to ease the process of setting up an HSBC corporate account, or expediting a DBS corporate account opening. Our advisory services combine our network in Hong Kong, China and France to provide pertinent, customised solutions that enable you to set up a company in Hong Kong quickly and efficiently, with a view toward profiting from markets in both Hong Kong and Mainland China. Fung, Yu & Co. provides a strong right hand to serve as a Hong Kong company registration service, to provide a local company secretary in Hong Kong, and to act as your go-to expert for local business advisory services. We are committed to providing the level and scope of services of an international firm, with the personalised attention and quality of care of a smaller firm. We encourage you to contact us and learn more about how we can tailor our services based on your company’s current needs, and your future expansion plans in the region.